How to guarantee the weather – go to the T Register’s T Party every summer! Once again we had glorious weather, this time at the new venue for us of Bicester Heritage. 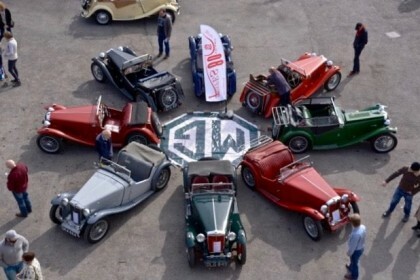 This was the second holding of their Flywheel Festival and it looks to be turning into a mini Goodwood Revival. The thought that came into my mind was Shuttleworth on steroids. We had 42 T Types attending, down on previous years. Maybe it was because of the new and unknown venue, but all who came had a great time and there was lots to see. Bicester Heritage have a mini display racing track where you can get up close to the cars. They had some historic racing cars going round the track and in a display area where it was even easier to get up close to them. There were 1st World War dog fights, Spitfires and Hurricanes – and the attendance of Sir Stirling Moss who was only too pleased to be seen by by all who were there. There’s an album of photos on the T Register’s Facebook Page, and a video of clips taken at the event on the T Register’s YouTube Channel as well. They show a mixture of photos of T Types and their owners, cars going round the racing track, a Spitfire in the sky, and last but not least of Sir Stirling himself. The T Register had a very successful time at MG Live this year, not only coming second in the best stand competition, but also being awarded the Nuffield Gold Cup! There is a separate page describing all the events at MG Live this year. 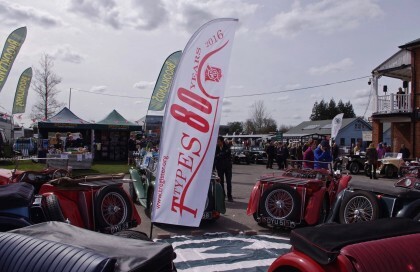 Alan Wakefield who organised the T Type presence reports on a record breaking turnout of T Types at MG Era day at Brooklands – Despite an earlier gloomy weather forecast, the sun shone on a well-attended MG Era Day at Brooklands Museum on Sunday 10th April. This is an annual gathering, but this year was celebrating the 80th anniversary of the introduction of the T-Type Midgets. With the help of the MG Car Club T-Register, some 65 T Types representing all models were assembled around the iconic Clubhouse Paddock of the famous Brooklands Motor Course with the featured 16 TAs arrayed around a large MG Octagonal floor banner. James Thomas had driven TA#1717 up from Devon; Mary Medhurst’s car (TA#2272) had come from Northamptonshire; committee member and T-Racer, Jonathan Harmer, brought his TA race car (GNU 608) out of retirement all the way from Kent. 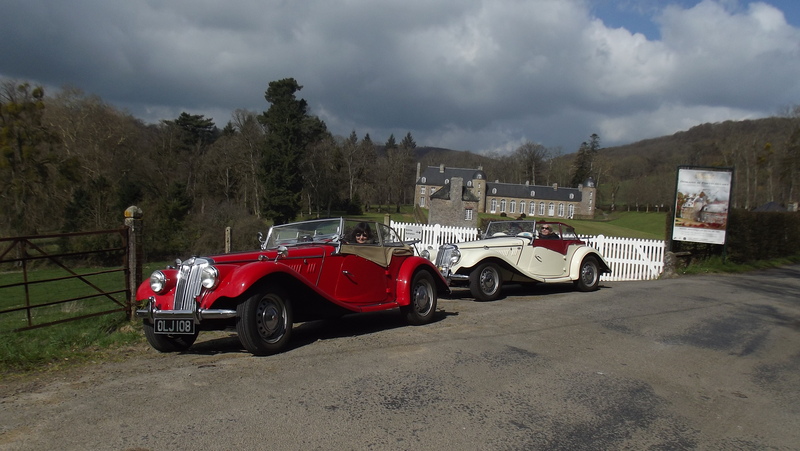 Particularly welcome was the 1939 TB (# 0258) with a celebrated history as the competition car of pre-war MG racing lady Betty Haig. Immaculately restored, it won the Car of the Show award for Anthony and Brenda Atkinson on the day. Last-minute entrant Anthony Rands was another award winner with his recently restored supercharged TC. Club Director Dave Saunders brought along both his immaculate TA and his TC. And brought out of retirement for this event was another unique TA Special, which was originally built in 1969 by Vickers apprentices at Brooklands, and completed by current owner Larry Rose (then in the Vickers drawing office) in 1972. 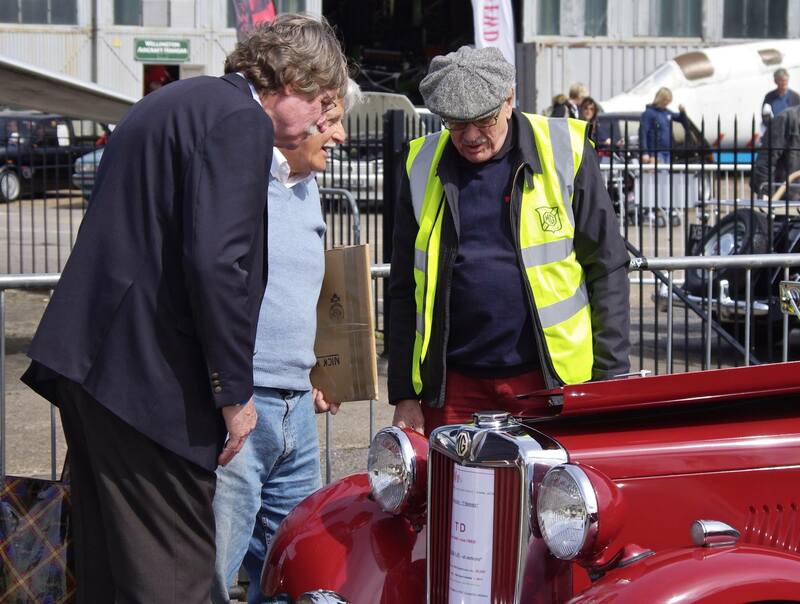 Chris Collingham brought his ex-Lancashire Police 1937 TA complete with bell. Many TCs lined up in support of their TA elders and together with an extensive gathering of TDs and TFs, made up a paddock of 40 cars, with the rest overspilling onto the adjacent Finishing Straight. Could well have looked like Brooklands in its heyday! Not only were all these splendid T Types on static display. Many of them were included in the Cavalcade run around the adjacent Mercedes Benz World test circuit, which is built on part of the old original Brooklands Campbell Circuit and the former Vickers Aircraft works main runway. Other owners blasted their T Types up the famous Test Hill later in the afternoon – could you do it in 2nd gear, and still get over the 1 in 4 steep section at the top …? Many thanks from the organisers to all the T-Register members who brought their cars along to make this day a special event in the T-Type calendar. Early feedback seems to confirm that a good time was had by all! You can see all 55 pictures of the event on the T Register Facebook Page. 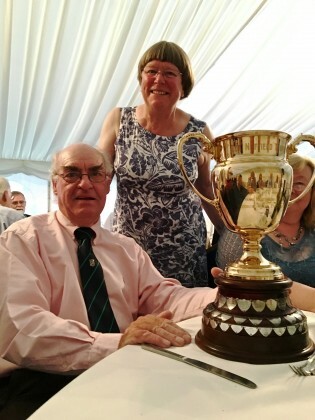 Sally Silcock reports on a successful trip despite vagaries in the weather. What do I remember about the trip? Sunshine, cold winds, wild flowers, rain, good company, hail, great food, great driving and a lovely area to visit. So it had its good and bad points, but for so early in the year we really can’t complain about the weather, and the rest was great. Bill and I were really lucky in that we always seemed to be under cover when the weather was at its worst – already in the hotel when it rained hard on the people who had just come over on the Portsmouth-Caen ferry, having lunch when it rained about midday on the Wednesday, and in the Pegasus Bridge museum when it hailed hard on the last day of the trip. Did I read somewhere about the sun shining on the just? Unlike most participants, Bill and I used the Chunnel. 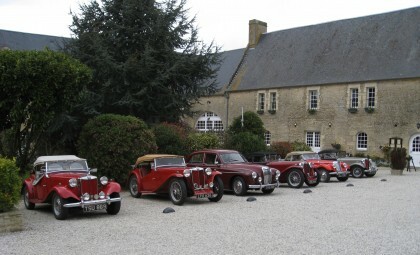 We drove down through northern France to Normandy on the Sunday before the event, having stayed overnight about an hour and a half from Calais. The idea was to arrive at the hotel, la Ferme de la Rançonniere in Crépon near Bayeux, in time to pick up some information I’d asked the local Tourist Information Office to send to the hotel, sort it into information packs for participants, and be ready for everyone else to arrive on the Monday afternoon, having done a bit of a recce (where is the nearest petrol, pharmacy, bank, bar . . .?) as well. We’ve used the hotel before, but are generally passing through so weren’t sure of that sort of detail. We learnt that even on a cold Monday morning in early April it isn’t very sensible to expect 17 T Types to find parking in Arromanches, which was full of (other) foreigners trying to find the same thing. Luckily you don’t need to go into the village to visit the museum, which is just outside. The Portsmouth ferry docked at three, and most of the participants started to arrive about four pm, some of them looking a bit like drowned rats – luckily the hotel is well heated, and our rooms had plenty of space to dry things out. Dinner was at 7:30, by which time everyone had had a chance to dry out – and most people to try out the bar as well (we’d warned the hotel to get in extra draught beer). Over dinner we had a chance to discuss the next day’s activities, and many of us decided to take the opportunity of a fine forecast to follow the Route de la Suisse Normande, which is signposted by the tourist board and so doesn’t need a route book. We hadn’t done a route book as we understand that these days getting permission for even a touring assembly in France is very complicated and time-consuming. The Route de la Suisse Normande was great fun, and I’d thoroughly recommend it to anyone who’s in the area. It’s signed in one direction – anti-clockwise, which means you have to turn left across any traffic – only, and we discovered why, when we came to a one-way section. This was the day we saw the most flowers, including primroses, cowslips, oxlips, bluebells, wood anemones and wild daffodils as well as the little ones, like speedwell, that you never normally even notice. In spite of the name it wasn’t very like Switzerland, but a lot like the Belgian Ardennes, with steep river valleys, beech woods, and narrow lanes meandering up, down and through it all. Steep gradients, sharp corners, and a wonderful view from the one-way bit on a crest just about sums up the driving – I wouldn’t like to do it on a really wet day. It was well-signposted too, although sometimes the signs took a bit of spotting. On day two the group did a variety of things – some went to tour the beaches of the Normandy Landings, some to Bayeux to see the tapestry, and some to visit local gardens. Having done the Suisse Normande tour the day before, we decided to have a go at the tour of the cider country, which is shorter, but comes complete with cider and calvados producers to visit. Not such a nice day, but pleasant countryside- a bit like Devon – and some beautiful timbered houses on the way round . The highlight was probably the village of Beuvron-en-Auge where we started and finished the tour – it has a tourist office, so if you wanted to do the tour you could go to Beuvron and get the information there (for the Route de la Suisse Normande the equivalent point is Thury-Harcourt). Having ‘done’ the tapestry and the Normandy beaches on a previous visit Bill and I decided to spend our last day visiting Pegasus Bridge. We’ve crossed it a number of times – the first time we didn’t realise it was Pegasus Bridge until we got there, having only used it because it was a convenient way of avoiding the Caen ring road – but had never stopped to look. The museum, which has recently been re-organised, was definitely worth the visit. It has lots of information about the preparations for the Normandy landings, which included taking the bridge across the river seaward of Caen – it’s now called Pegasus Bridge after the cap badge of the force that took it – as well as a number of others that together stopped the German forces getting reinforcements to the area the landings would take place in. It also has more general information about life in the Normandy area on both sides during WWII, and photos of the terrible destruction caused by Allied as well as German bombs. I think the most impressive thing was to see, outside the museum, three plaques that marked where the three troop-carrying gliders landed to take the bridge – they weren’t more than 50 feet apart, and the third to land came down between the other two. Tremendous flying! And in the dark too. As one of the organisers, it’s always difficult to say ‘everyone enjoyed themselves’, but I do know that no-one complained of anything to us, and I had a stream of enthusiastic e-mails and a thank-you card in the week after we all got home. We like the hotel, which has very good rooms and excellent food, and it seems that everyone who contacted me agreed with us. We enjoyed the company too – thank you all for being such excellent participants – and there was plenty to do for all tastes, although I must admit I don’t think anyone chose to go for a swim. We’re thinking of doing a similar event in the Belgian Ardennes next spring, although it depends on being able to get a decent deal at a suitable hotel. Ideally this would be a bit later in the year – say about the middle of May – but that too depends on the deals available. We could even make such an event an annual feature of the T Register calendar: feedback on your thoughts about this would be welcome to treg.sec@virginmedia.com. You can see more photos of the trip on the T Register’s Facebook Page. A successful day at the T Register’s Rebuild Seminars held at the British Motor Museum, Gaydon on 19 March 2016. We were greeted by Nick Holyer’s MG TQ – a TA with a crank driven supercharged XPAG engine and alloy Q Type bodywork. It attracted a lot of attention from other clubs who were having an event there on the same day. We had a distinguished participant in the form of Aubrey Paverd from the MG T Register of Victoria whom I’m sure came all that way just to attend … here he is being greeted by our Chairman Graham Matthews. We were treated to a talk from the vastly experienced Derek Stevenson of Stevson Motors on Girling shock absorbers, followed by sessions on TABC and TDF brakes. 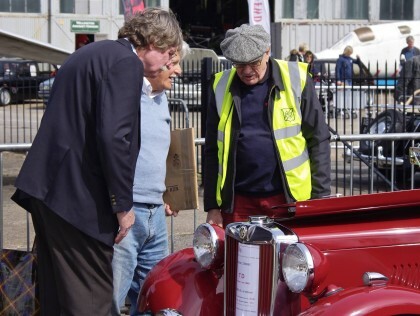 Participants got free entry to the revamped Museum at lunchtime and the afternoon was taken up by talks on oils for your T Type by Guy Lachlan of Classic Oils – that guy knows his stuff, and on the T type back axle. We finished up with a very in-depth talk by David Newman of Newman Cams on camshaft design where many questions were asked about overlap, cam followers, cross-drilling camshafts, valve lift, valve spring pressures – the list just went on. And we got unsolicited compliments from first-time attendees – a good day all round. You can see photos of the day on our Facebook Page. 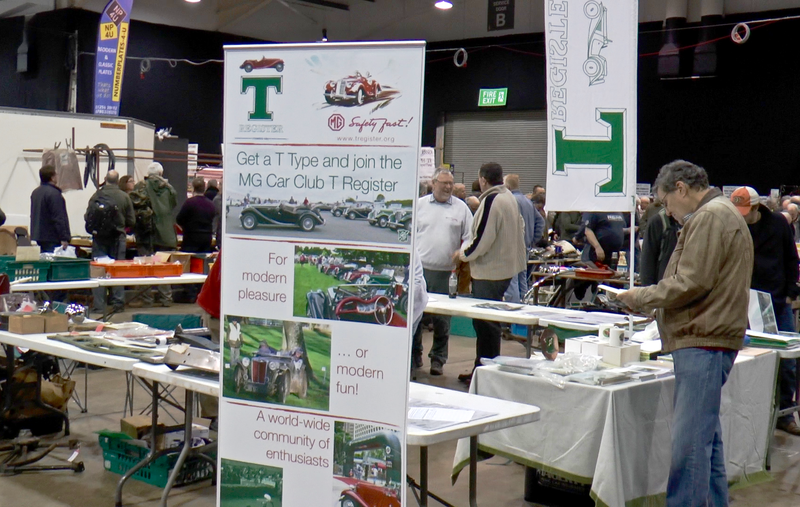 The T Register once again had a stand at this event on 21 February. 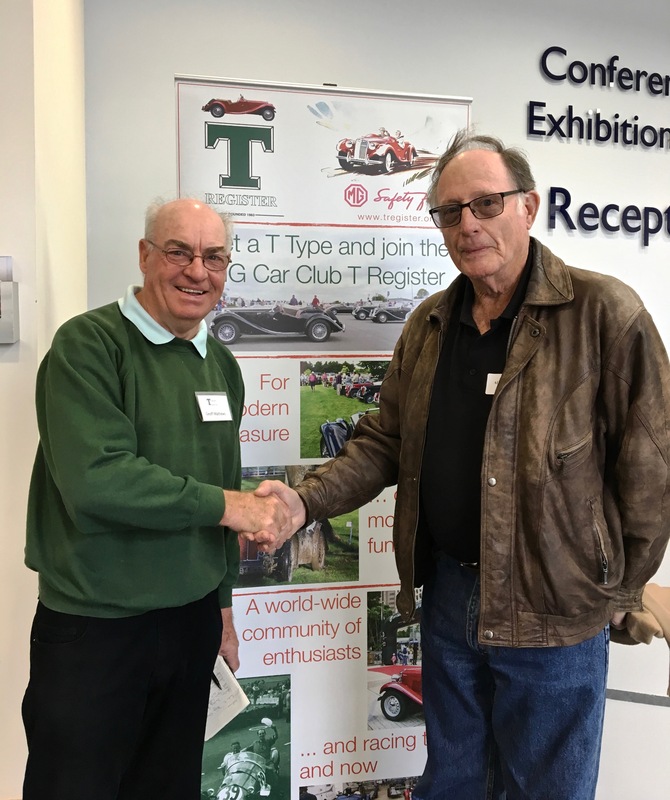 We had members’ spares for sale, we were advertising the T Register Rebuild Seminars in March, we were getting new recipients for the new email Newsletter (welcome to you all and many thanks for signing up!) and we had our new rollup poster advertising the Register. You can see the stand on the left. The Stoneleigh show is always a peculiar event held in halls which were originally designed for agricultural shows and it encourages lots of traders selling second hands parts. In the afternoon lots of people were departing with smiles on their faces and bits of tin over their shoulders. There is an album of photos taken at the show on the T Register’s Facebook Page, and a video of all the T Types that were there on our YouTube channel. Both give a flavour of the event if you weren’t there. A good event, with none of the problems that plagued it last year.